Preparing hearts and minds to love God, love people, enjoy learning, and become world changers! RCS Preschool offers a wide variety of Christian-based curricula that engage students in learning God’s Word while experiencing the world He made. In addition to the academics, students ages 3 through Pre-K participate in chapel, music, art, and Kid’s Fit. 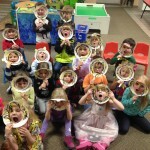 The three through pre-k classes engage in two performances every year: A Christmas program in December, and a spring concert/Art Show in April. Children also participate in a field trip, a family walk-a-thon and picnic, and promotion and graduation ceremonies.